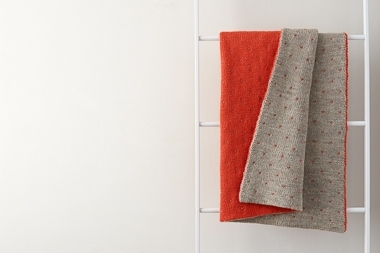 Our Double Knit Blanket is an heirloom knit for a new baby, an old friend, or even yourself. It is, indeed, double knit, a simple slip stitch technique that creates two layers of stockinette fabric at once. The result? One yarn on one side and another on the other… Needle magic! As you knit you'll also add little tacks to hold the layers together, a critical detail that truly sets this blanket apart. A wonderful mixture of rustic and refined, one side of our blanket is our undyed Good Wool, a straight-from-nature rugged beauty, while the other is our sumptuous Mulberry Merino with its subtle shine and smooth finish. Get them both with this Double Knit Blanket Bundle, which includes enough yarn for a baby-size blanket. For a throw-size just add one more skein of Good Wool and 2 more of Mulberry Merino! And for more information, click Product Details, above.